Karina's Kreations: Stampin'Up Sprinkles of Life! 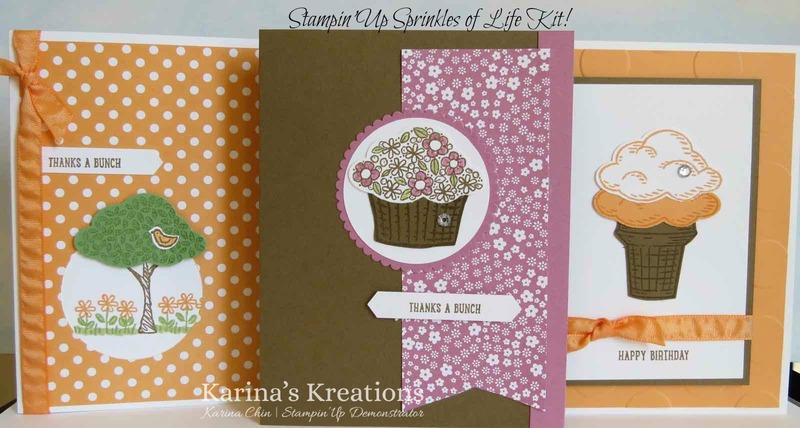 The Stampin'Up Sprinkles of Life stamp set is a fun stamp set with so many different combinations. 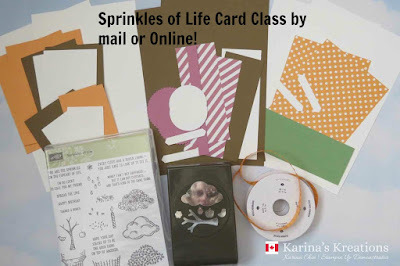 I'm so excited to present to you a card kit that I'm offering by mail. These are the three cute Sprinkles of Life Cards. You will get to make two of each. FREE Materials to make 6 cards (2 each of 3 designs) with 6 Whisper White envelopes. You will need Wild Wasabi Ink, Peekaboo Peach Ink, Soft Suede Ink, adhesive and a clear acrylic block to complete the class. FREE sheet of Stampin’ Dimemnsionals. Cost for Kit B which includes the three stamp pads and block C! Email me at kchin2@telus.net to get your kit!